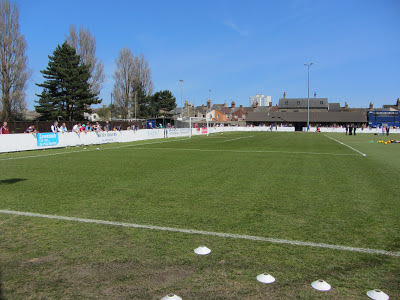 My fourteenth stadium of 2013 was on Monday 6th May 2013 at Crown Meadow in Lowestoft, Suffolk. The match was Lowestoft Town vs. Concord Rangers in the Isthmian League Premier Division Play-Off Final. Crown Meadow is located in Lowestoft town centre and is around half a mile north of the town's railway station. 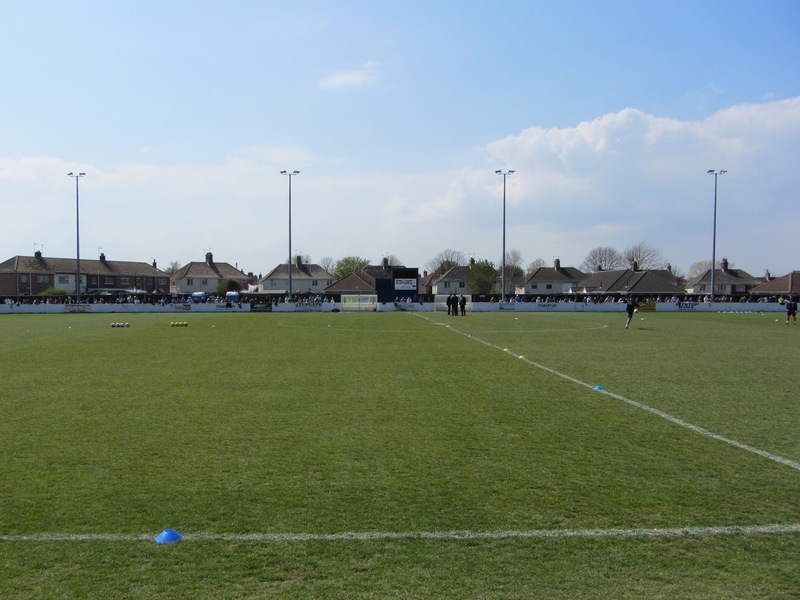 The ground has been the home of Lowestoft Town since 1894. The Main Stand is the sole all-seater structure in the venue and this sits level with the half-way line on the eastern side of the ground. The stand has enough seating for around 450 fans. Adjacent to this is a covered terrace consisting of raised concrete steps. This stand extends down to the southern end of the ground. Fans in these two stands are likely to have their views somewhat restricted by the four floodlights which sit in front of the barrier, right by the side of the pitch. The remainder of the ground consists of uncovered standing except for a very small covered section directly behind the goal at the northern end of the ground. The ground is quite cramped behind both goals which are little more than concrete walkways. However, this game's attendance of 2,490 was three-times the usual gate for the club so lack of space isn't a major issue. The player dressing rooms are situated next to the Main Stand and the remainder of the facilities, including the clubhouse, are at the southern end of the ground. The game was an important one for both clubs with the winner guaranteed promotion to the 6th tier. Concord started the stronger and took the lead in the 13th minute when Ben Greenhalgh's free-kick was met by the head of Steve King who directed his header into the bottom of the net. A couple of minutes later it was almost 2-0 to the visitors as a cross was curled into the box and just missed an advancing Concord player at the back post. Fortunately for Lowestoft they were shaken into action by this and shortly after they equalised. It was another header from a cross, this time Scott Mitchell glanced the ball into the far corner of the net with Dan Gleeson claiming the assist. The away side then had to withstand a lengthy spell of pressure as Lowestoft had numerous set pieces to try and score another goal. Concord weathered this storm and the two sides reached the interval all-square. The second half never really got going as there were several stoppages for injuries which disrupted the flow of the game. Lowestoft had plenty of the ball but didn't really look like doing a lot with it and in the 85th minute the visitors grabbed the winner as Leon Gordon struck from close range. The frequent injury stoppages meant there were seven additional minutes at the end of normal time for the home side to try and get the equalising goal which would force the tie into extra-time. 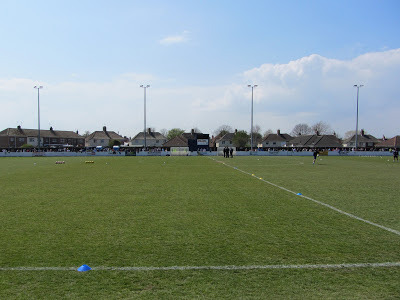 Their best chance came from a mad scramble from a corner but Concord were able to clear their lines meaning Lowestoft were consigned to their third successive play-off final defeat with Concord Rangers gaining promotion to Conference South.